Samsung Galaxy Tab S2, by far the most frivolous tablet has been published recently, Galaxy Tab S2 8.0 with a resolution of 1536 x 2048 8-inch Super AMOLED display, while Galaxy Tab S2 9.7 the configuration is a resolution of 1536 x 2048 9.7-inch Super AMOLED, you can play your downloaded movies on this high-definition screen. Both equipped with the same Exynos 5433 processor, 3GB RAM, 32GB / 64GB optional internal storage, expandable up to 128GB of support MicroSD card slot. So, there is no pressure transfer some HD movies to Galaxy Tab S2 for playing on spare time. If you have got a Galaxy Tab S2 on your hand, would you like to watch HD movies on it for its HD display? Since you’re here, you probably know by now that the device, has limited video format support, usually just supporting MP4, AVI, 3GP and so on few video formats, a big inconvenience for users. So then how do you convert video for the Samsung, so it will play properly? According to Samsung Galaxy Tab S2 specification, Galaxy Tab S2 supports MPEG4, H.263, H.264, DivX, XviD and WMV videos. 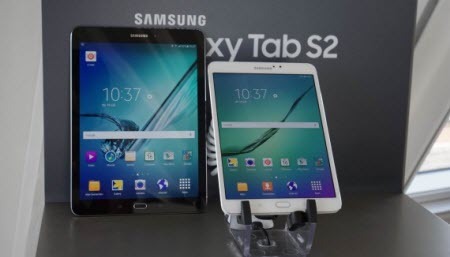 So, In order to successfully play all kinds of video files on Samsung Galaxy Tab S2, a recommend solution is to convert MP4, MKV DTS, AVI, WMV, MOV, WTV, MPEG, DivX to Samsung Galaxy Tab S2 supported MP4. This article will guide you with a step-by-step to convert video to MP4 to successfully play on Samsung Galaxy Tab S2. Pavtube Video Converter Ultimate enables you to convert any HD videos to almost all Android devices (Samsung Galaxy Tab S2, Galaxy Note 4, Galaxy S6, HTC One etc.) at a very high speed and delivers possible highest quality. The editing tools can help you crop, trim, merge videos and add subtitles for videos. Also, you can customize audio/video parameters, bit rate, frame rate, resolution etc. Here is review. As an H.265/HEVC decoder, it can also convert H.265 video to Galaxy Tab S2 supported format for playback on Windows 10. For Mac users, turn to iMedia Converter for Mac. Step 1: After the successful installation, click “Load file(s)” or “Add video” to load video file you want to convert in your PC into the program. It supports batch conversion, you can you can add movies in different formats like HD videos at one time. Step 2: When you click the ‘Format’ bar to come to the output list, as we mentioned above, we can suggest you to choose the ‘HD Video’>>’H.264 HD Video (*.mp4)’ as the best output one. For others? You can drop down the list and find more. And the video/audio parameters can be reset in “Settings” to achieve a satisfying playback in for Galaxy Tab S2. Step 3: Hit the big button “Convert” to get the cork started. If you follow several steps mentioned above, after easily transferring files to Galaxy Tab S2, we can enjoy the HD videos nicely with high definition. Would you like to have a try?